The school store has been a great vehicle for learning at St. Albans City School for many years. The store is run by students in grades 4-6 and carries low cost items that might appeal to other student for purchase. The school store not only has students running the store, and students as consumers, but now it also includes students as MAKERS of items in their store. What a great way for students to be involved in each phase of entrepreneurship. Students in the 7th and 8th grade 3D modeling and design class met with their 4th, 5th, and 6th grade peers who run the school store to learn about the types of items that might sell in the store. They asked questions about who their customers were, what they purchased, and what the ideal price range was for items available in the store. These interviews were the first step in the Design Cycle that help the St. Albans student makers empathize and better define the problem they were about to solve. How might we use our 3D printer to create products that will sell in our school store? As they tested their prototypes they made adjustments that helped the products work better which also helped them sell better. Getting a clip that was safe for younger customers and that little fingers could easily open was one the challenges they mastered after a few iterations. 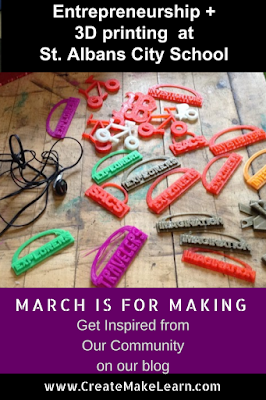 Combining entrepreneurship and maker centered learning seemed like a natural fit for the 3D modeling elective and a great way to make use of their school makerspace. The St. Albans City School makerspace is two years old and includes three 3D printers (2 Printerbot Simple Metal and 1 Makerbot) ,soldering stations, a vinyl cutter, a laser cutter, and shelves filled with maker supplies. 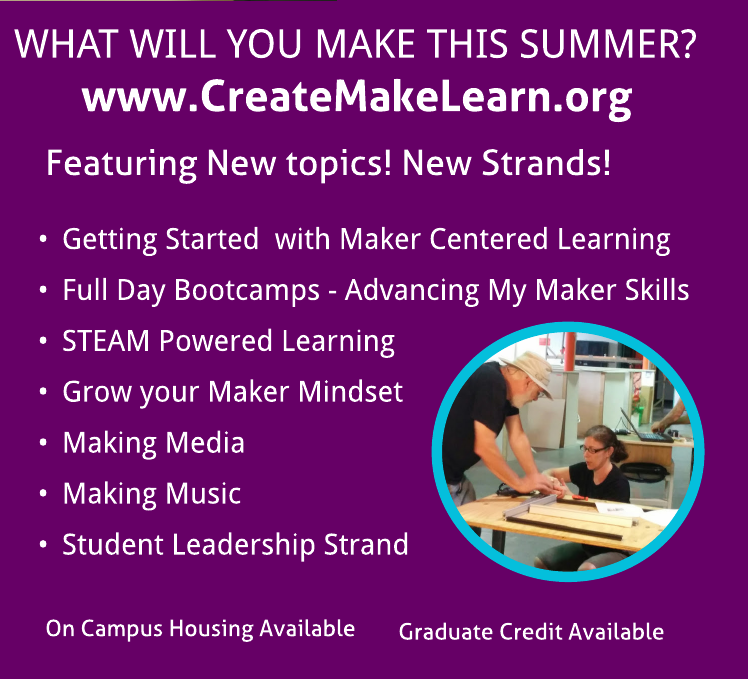 Students and teachers use maker tools in the centrally located makerspace, but also bring back tools and supplies to their own classrooms. Not only did this 3D printed entrepreneurship maker centered project provide them with a real world opportunity to use their maker tools and skills, but students also used real world tools (Google Docs, Google Forms, and Google Sheets) to create workflows, inventory checklist, and cost analysis. The students used Tinkercad on their chromebooks to design their 3D models. Once the 3D model is ready to be printed, the stl files are shared using to a Google Drive folder and a Google Form is completed to help manage the workflow. Improving the workflow was as much a part of the learning as was learning how to use Tinkercad. Students keep a design journal and offer each other feedback before they send their files to the print queue. Both the student designer and their peer feedback partner are responsible for increasing the quality and success rate of the 3D prints. Most of the items were a big hit at the school store. Some of the top sellers were items that were theme based (i.e. Holiday themes) and items that were personalized with team names or school logos. Combining entrepreneurship with maker centered learning is just one way that St. Albans City School puts its makerspace to use. 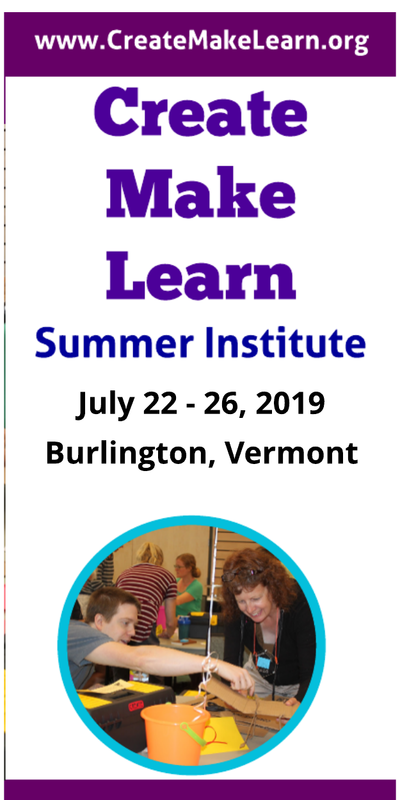 St. Albans teachers involved with this project (Erica Bertucci, Grace Borst and Roland Wilhelm) wear multiple hats from STEM teachers, tech integrationists, and maker mentors for teachers and students from pre-school to eight grade.